Ms. Charlene Gleazer is a mentor for the Bridges program that gives after school tutoring to immigrant students. Here she is helping Natasha Louison at Eastern Middle School. Jenny Li is a senior at Blair High School who had a good experience in Silver Spring International Middle School that is still helpful for her at Blair. Jenny was a lucky student who got special help from a program called Bridges. When Jenny Li was a middle school student, she didn’t go home after school. Instead she went straight to the Bridges Program when the school was over. 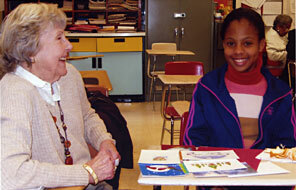 “I loved to go to meet my wonderful mentor Ms. Charlene Gleazer,” Jenny said. Then after the program was over, her mentor provided her a ride home, so she wouldn’t have to worry about getting home. Ms. Charlene is a retired person who goes to help out in the Bridges Program. She wants to help students to be successful and help them to achieve for their future. The Bridges Program meets after school one time a week for approximately one hour, but some may stay longer. This program is run by a non-profit organization call the Interages. Interages finds senior citizens to help the new immigrant students with support, teach them the way of life in the United States, and helps them with their schoolwork. The schools in Montgomery County that have Bridges now are Rolling Terrace Elementary, Eastern Middle School and Sligo Creek Elementary School. Bridges is a helpful program. Mentors help students to develop better communication skills “The aim of this program is to help students to feel comfortable, help them one by one with individual help and to build confidence for them,” Elaine Lessenco, the director of the program said. Ms. Lessenco enjoys running the program and being a mentor as well. Ms. Lessenco has been mentoring for almost 8 years because she likes it so much and she is interested in learning other things from different students. “I love the children, love meeting people from all over the world,” she said. Ms. Charlene Gleazer has been helping the immigrant students in the Bridges program for 8 years, too. First she started at Rolling Terrace Elementary School, then she moved to Silver Spring International Middle School and now she is at Eastern Middle School. Ms. Gleazer really enjoys helping immigrant students, not just to achieve their goal, but also to help them to have more experience in this society. “I like to help students and teach them to adopt to this culture, but not take away anything from them. Also I like to watch them grow,” she explained. The relationship between Jenny Li and her mentor Ms. Charlene Gleazer still keeps their relationship going, even though Jenny is in Blair High School. They still keep in touch with each other and Jenny’s mentor is still there for her when she needs some advice. For instance sometimes she has problems with her college applications or other personal things. “My mentor takes me to see different campuses, gets information from the colleges and I feel more confident with my personal things. I will keep our relationship and will not forget our good time that we spent together,” Jenny said. Many former students agree that Bridges is a helpful program.